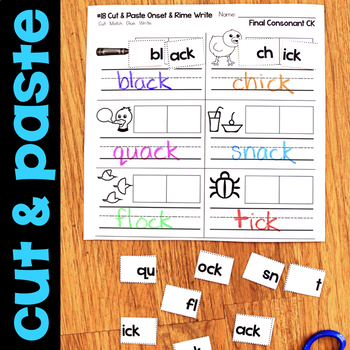 These Final Consonant CK worksheets are perfect for your phonics word work centers. They focus on all digraphs with short vowels and include 62 NO PREP printables to practice initial blends. 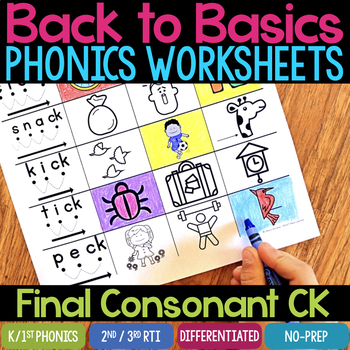 The Final Consonant CK words in this set of phonics worksheets include short vowels with CK. 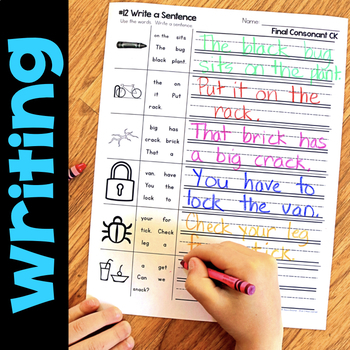 The sentences contain digraphs and build off the Short Vowel Worksheets, Digraph Worksheets, Final Blends Worksheets, and Initial Blends Worksheets. This product aligns with my Blending Cards and Phonics Worksheets for CVC Short Vowels. For more information about the blending cards, see this blog post. Blending cues (dots to segment the word, dotted lines to blend the word, and a large arrow to "read it fast") are included on many of the pages. 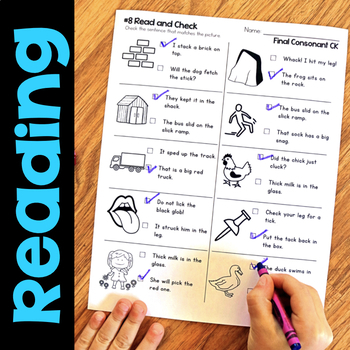 Students can use the blending cues to read the word, then do the work on the worksheets. These can also be printed at a reduced size and can be used for interactive notebooks. See this blog post for information on how to do use these worksheets for interactive notebooks. There are 18 worksheet templates with multiple versions of all templates. Words are listed in the preview. Mixed Initial & Final Blends - coming soon! See the preview for additional information, a list of words, and photographs of all 18 different worksheets. Copyright © Jessica Boschen. All rights reserved by the author. This product is to be used by the original downloader only. Copying for more than one teacher, classroom, department, school, or school system is prohibited. This product may not be distributed or displayed digitally for public view. Failure to comply is a copyright infringement and a violation of the Digital Millennium Copyright Act (DMCA). Clipart and elements found in this PDF are copyrighted and cannot be extracted and used outside of this file without permission or license. Intended for classroom and personal use ONLY.